I have been an Apple convert since January 2004 when I bought my first Apple product. A 12 inch white iBook. Then I bought an iPod Nano, an iPod Touch, a Mac Mini, an iPhone, another Mac Mini and another iPhone. Not to mention the countless of Apple keyboards I went through because I have a bad habit of spilling water on them. For nine years Apple was my go to brand, no question asked. It still is. I can’t imagine going back to Windows full time. I have a work flow and list of applications that can’t be replicated on Windows. It just works for me. But an iPhone is not a must have anymore. Maybe I’m getting old, maybe wiser, who knows. Where once I always got a new phone as soon as my contract was up for renewal, I now kept my iPhone 4 well past contract expiration date. Mobile data has become as expensive if not more than home internet. Renewing would mean higher monthly cost for less and paying more for an iPhone than three years ago. Before the iPhone 5s was announced I got the idea to switch to Android. I’d seen commercials of the HTC One and after having the same interface layout on iPhone for 5 years, I was intrigued. I went to the phone shop to check out the HTC One and Sony Xperia Z. They are faster and have more options than the iPhone 4. But they are all huge. I’d need two hands to use the phone and that is just a no go for me. The iPhone 5s is flawless on hardware but on software it no longer holds my interest. Apps for iOS are great design wise but I have grown tired to be so limited by iOS. I can’t justify anymore to pay the price of an iPhone just for a fancy fast phone with an OS I can’t bend. I decided on Android, I just had to do lots of research to buy the best phone for me. When telling people about my quest for an Android phone I realized that no matter how tech savvy or not, not everyone knows the finer details. When buying a phone brand you are getting their version of Android. Samsung, HTC and Sony amongst others have created their own ‘skin’ on top of Android which is developed by Google. Extra features(not always useful) not standard provided by Google. Lots of applications you might not use and can’t uninstall taking up space. When Google releases a new Android version it can take up to a year before phone companies have updated their own skins and release the Android update for their phones. Also, they mostly only give a phone two updates before stopping update support for certain models. Android without any skins or modification is called stock or vanilla Android, which means it doesn’t contain any applications by external parties. 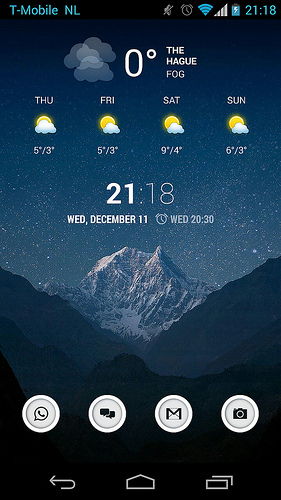 You can setup your phone the way you want it to look. Nexus, currently developed by LG for Google. Google Edition phones sold via Google Play Store(Not available yet in The Netherlands for devices). First I must say, I’m not a power user. I use my phone to email, text, browse internet, Twitter, Instagram, check weather, train, bank, agenda, take notes, as alarm clock and read ebooks. But I do use these things often and all day long. I’m never without my phone. Basically the iPhone 5s is overkill for these tasks, hardware wise. Unless you plan on using the phone for more than 2 years when newer iOS and app versions will make the phone slower over time. Faster than the iPhone 4(or current phone). Screen smaller than 4.7 inch. Doesn’t break the bank with a one year data only contract. My choices were Nexus 4, Nexus 5 and Moto G. Nexus 4 is too expensive(here in The Netherlands) compared to the newer and better Nexus 5. I would go for a two year contract with the Nexus 5 if it wasn’t so big(5 inch), with my small hands it would be like a small tablet. That leaves the Moto G. The only huge downside is the Moto G camera, I really had to make a concession there. But otherwise Moto G meets all my needs. Side note: My solution to the bad camera, especially when taking photos that I want to put online right away, is an Eye-Fi Memory Card for my Nikon D3100. This way I can snap a photo and it will automatically be uploaded. While I don’t always have the Nikon with me it is a good compromise. It wasn’t hard at all to learn how to use Android. The most complicated part for me was getting the hang on how to customize the home screen. Popular tutorials don’t give you the “step by step for dummies” version. So I just spend half a day playing around with the phone until I got how it’s done. Take a look at all the possibilities with Android and the right apps. The great thing about Android is that you have lots of options. Amongst other, you are not limited on what apps you can open a file or share a file with. For example, if I open Dropbox and choose a PDF file I can share it with the following apps: Contacts, Messaging, Google Drive, Email app, Gmail, Google+, Hangouts, Twitter and WhatsApp. I can also just copy the link to that file. I can export the file to my phone, Kindle, Bluetooth Device, Google Drive, Email app and Gmail. I’m happy with my new phone. It’s refreshing to be using something else than iOS, having more freedom on how to setup the interface and functionality, feeling good about not having spend a lot of money on it and yes also the fact that for now not everyone and their grandmother next to me has the same phone and never the same home screen. * An iPhone lover’s confession: I switched to the Nexus 4. Completely.